EVGA is offering carbon fibre shroud and trim kits for their GeForce RTX 20 series graphics cards. Last September, EVGA offers coloured trim kits for its GeForce RTX 2080 Ti and RTX 2080 graphics cards. 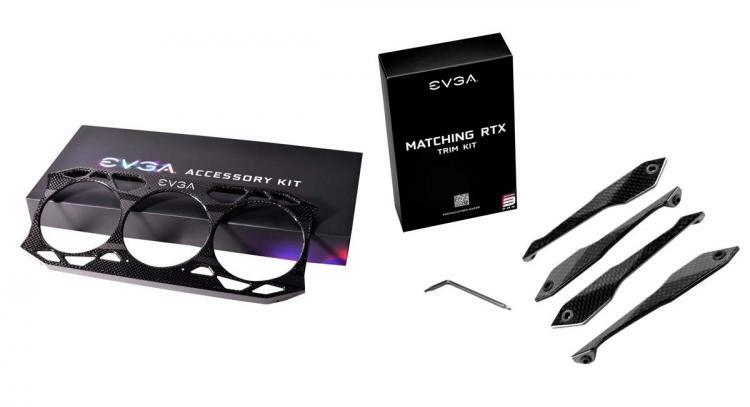 The new EVGA RTX Accessories now include the limited-edition Carbon Fibre Shroud and Carbon Trim Kit is the next upgrade to make your EVGA graphics card stand out among the rest. The shroud and trim kit are made of real 100% Carbon Fibre material. The shroud and trim kits are exclusively compatible with the EVGA GeForce RTX 2080Ti FTW3 and GeForce RTX 2080 FTW3 graphics cards. Note that the Carbon Fibre shroud has a different design compared to the stock shroud which will disable the side logo illumination. EVGA is giving a chance to win either a Limited-Edition Carbon Shroud or Carbon Trim Kit for your EVGA GeForce RTX 2080Ti FTW3 or RTX 2080 FTW3 graphics card. The Carbon Shroud and Trim Kit Giveaway begins Wednesday, December 5, 2018, and ends on Wednesday, December 12, 2018. Learn more about the giveaway here. The Carbon Fibre Shroud for EVGA 20-Series FTW3 Cards is now available at EVGA.com with an MSRP of $99.99. The Carbon Fibre Trim Kit for EVGA 20-Series FTW3 Cards is also now available at EVGA.com with an MSRP of $99.99 as well.